Precompetitive Anxiety in Climbing: "Redpoint Anxiety"
How do you manage those attempts? Have you ever felt that you fell because you couldn't control your anxiety? Reversely, have you sent a route because you managed to stay focused and motivated and performed at your 100%? How significant is that particular try or redpoint to you? Are there any thougts or external factors that make you more tense? Do you know how to identify them when they appear? What consequences does anxiety have over your performance? Do you have any strategies to mitigate or take advantage of that tension? In sports this translates into winning/losing terms, an this way victory is demanded for fulfilling some political, financial, social or even emotional agenda for those who seek social recognition. Failing that, scholarships are withdrawn, coaches are fired, and, even worse, the word failure is brought up. Soccer and olympic athletes are obvious examples. Training for the sake of self-improvement does not have the same appeal. 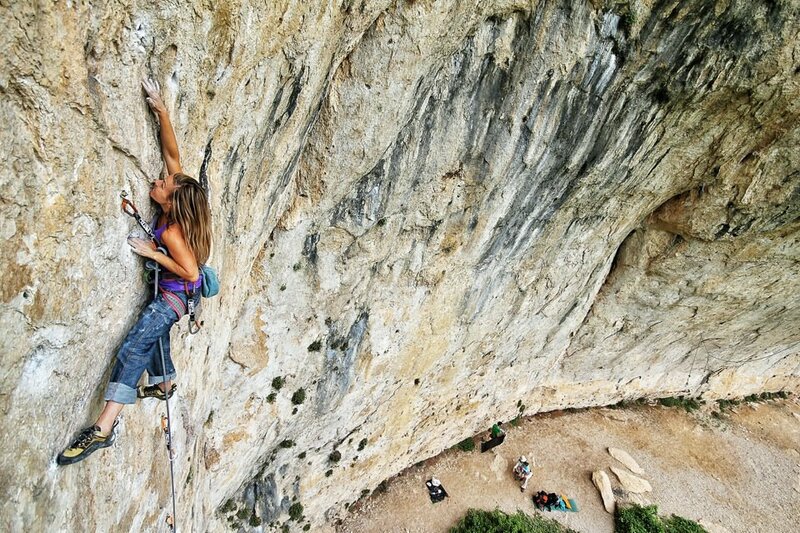 For example, a climber can feel compelled to climb certain grade, achieving some result in competition or doing some renowned testpiece. The problem is that all this pressure leads many athletes to -mistakenly- believe that they need to prepare their mind for maximum performance. In fact, what is really needed more often than not, is keeping at bay that pressure and anxiety. A certain degree of acitvation is good for performance, but the key is determining what our right level of activation is, because an imbalance in this factor often becomes a problem. Actually, one of the more frequent causes that athletes report for not being able to reach their full potential is the difficulty of coping with competitive anxiety. Assuming this approach, what we really need many times is to prepare our minds to avoid instability. 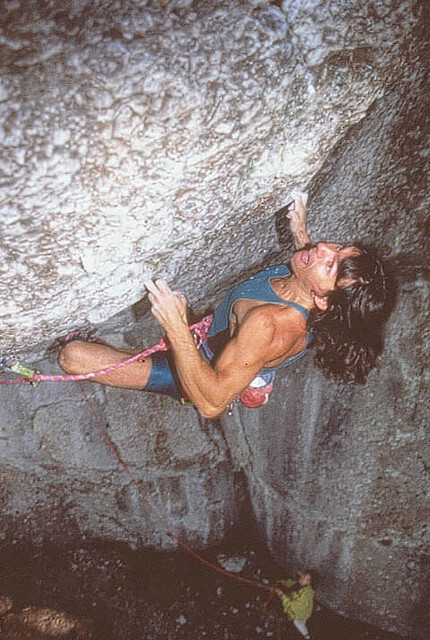 There are climbers who get to the crux and blank out, or get too tense and miss, that get distracted, or picture themselves failing and fall after reaching without conviction for the next hold. They often send the route when they feel very tired, or just want to "clean the route" or "train" in the route. 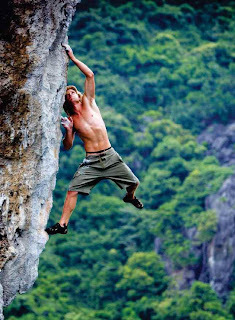 They have unconsciously used an strategy for climbing with less pressure, and it has worked for them. 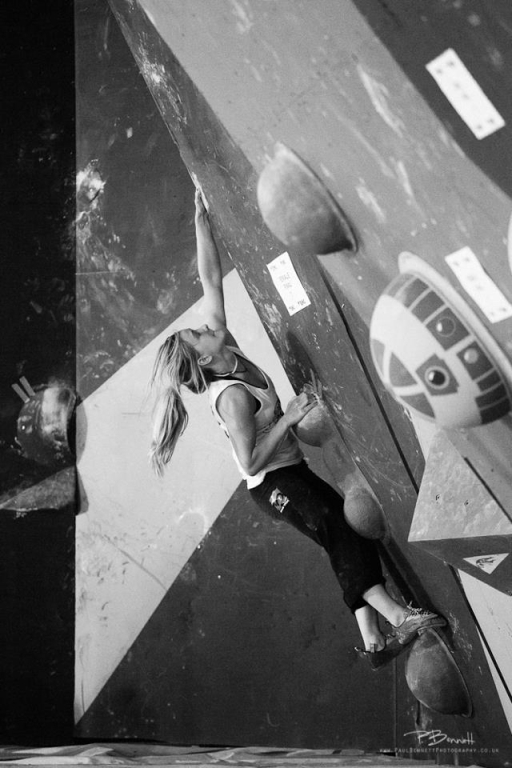 During the next entries we will talk about the perception and correct channeling of anxiety, the most common sources of stress, effective methods when facing a challenging route or a competition, and how all of this is linked to self-confidence and performance. 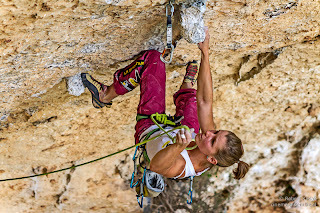 Precompetitive Anxiety in Sport Climbing: Interpreting your "Redpoint Anxiety"
Commitment to your training: Are you in sync with your goals? "The hardest part about training is making the decision to start training at all"
But, once you have made your mind, the big hurdle to overcome is the temptation to give up (Weinberg and Gould, 1996). There are plenty of excuses. The other day I had to do some running, and luckily, it was a very nice afternoon. It was inviting. It was a good day to be out there. So different from the previous month, when I got home several times completely soaked by the rain. But not this particular day: clear sky, warm weather... and easily the biggest crowd of walkers, runners and cyclists in the whole year. The same goes for the gym: when the good weather comes is when most people start to show up. 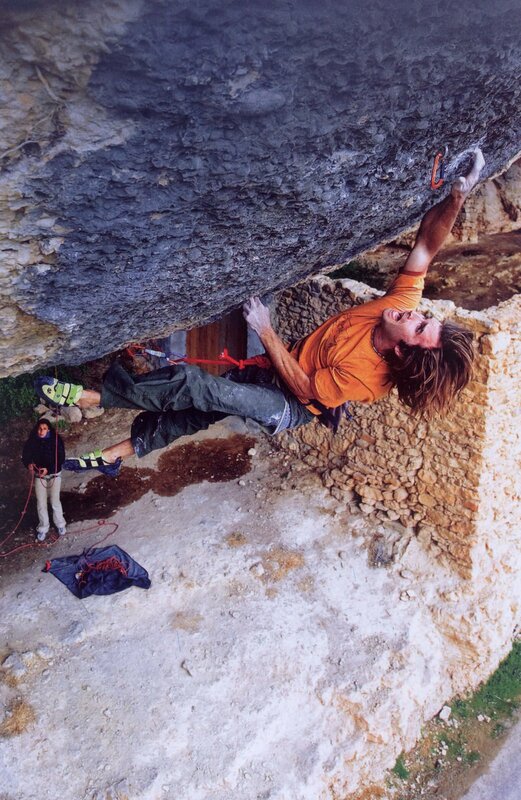 And then many people state their commitment: "Now I'm going to be "serious" about training, I'll come 2-3 days every week, and climb every weekends... this is it! Because the nice weather is here". Similar statements can be heard when the season starts, or after the summer holidays. Or in january. 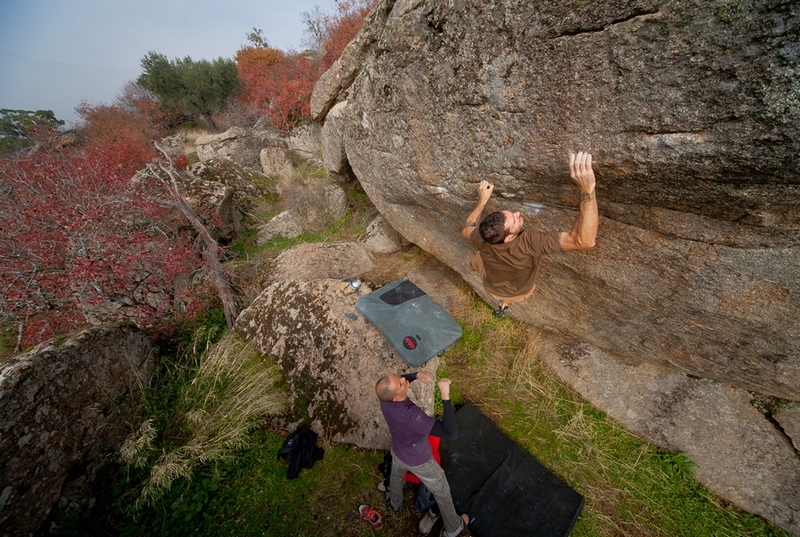 The climbing gym gets crowded. Later, as always, only the "usual suspects" remain; when it's too hot or too cold, as it is most of the time in Toledo, people start vanishing (no complaints here, because that way it's easier to get some quality training). There are people who never miss a session, and go training no matter if it's a holiday, it's snowing or scalding hot; it's the same if they don't feel like training it, or have some kind of personal problem, or they are tired. By contrast, there are others who only train when all external conditions are favorable, or when they feel like it. They're not persistent. What makes each one behave like they do? Is there any relation between approach and commitment, and the increase in performance, achievement or, even better, reaching athletic excellence? If there's something that sets apart the high level athletes, it's their quest for excellence, the desire to be the best in their sport. Their willingness to make sacrifices and their dedication is easy to perceive, they display a work ethic that translates into a higher motivation and persistence to fulfill their objectives. Reaching the top and staying there is the result of thousands of hours of work, process optimizaton, and a conscious and thorough drive for improvement. Is this feeling of self-efficacy and confidence what lets them endure the difficulties in their sport and their daily lives (Ruiz Pérez, L.M. and Sánchez Bañuelos, F., 1997). As Goleman (1996) writes, the effective practice will result from the coincidence of factors like long-lasting enthusiasm and resilience against every kind of drawbacks. Summing up, being, or wanting to become a high level athlete, needs a great motivation and confidence in the first place, and then, an involvement big enough to devote lots of effort and training hours. 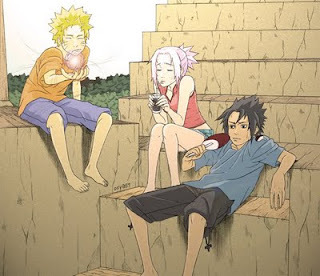 In most cases, at least here and now, it means that most of the time that is not spent working or attending basic needs like eating or sleeping, must be used for training or trying to lead a lifestyle favorable to our athletic aspirations. Experts talk about the 10-Year Rule (Chase and Simon, 1973), or the 10000 hours of deliberate practice (Ericsson et al., 1993) to master some activity. According to Ericsson et al. (1993), deliberate practice is a form of training that is not intrinsically motivating, that requires high levels of effort and concentration, and doesn't translate into immediate social of financial rewards. Yet there are many people who, not being as involved, are constant enough in their training, and show a healthy dose of commitment and persistence. How do they do it, or, how can we manage to get it? Finally, we will commit (or not) ourselves to devote that time, money and effort to fight for what we desire. Then it's "just" a matter of persisting, resisting... or reassessing the whole process. Very well, but, does this assessment usually take place? Do you establish realistic objectives and, more importantly, do you have enough involvement to achieve them? Do you ever ask yourself if you are investing enough time and effort to reach your goals? Have you ever wondered if your desires are unattainable, mere dreams that you know you won't ultimately fight for? How many hours and days do you allocate to tasks that focus on goal-seeking? Are you consistent with what you want? 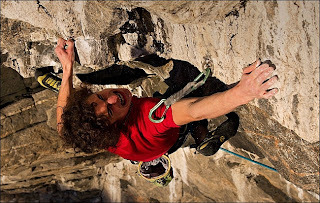 You will need to think if this is what you really want and can do, or if it's too hard to cope with both physically and psychologically, and so it would be better to move on and start climbing and training for routes that you can truly enjoy and be motivated with. Ola, finally you did it!! You want to perform a high volume of good quality training, but you are limited to one hour two days a week because you have three children, you work double-shifts and won't renounce to going out with your buddies twice a week... it's unmanageable. Figure out your priorities and assign your family, friends and training the time they deserve, while revising your aspirations accordingly. Be aware that if you give up you won't recover, and this will happen because your commitment isn't adequate. You want to make the podium in competitions or climb really hard routes but you only train or climb twice a week and every difficulty alters your training routine... it will be really hard for you to get there. Stop and think what really drives you and act accordingly. Remember the 10-Year Rule. Apart from setting ill-chosen objectives, low commitment, imbalance between needed (time, effort, aptitudes) and available resources, another reason for resigning is low self-confidence. There are people whose major motivation is avoiding failure, and will rather give up than facing the possibility of defeat... paradoxically, they prefer to provoke that same failure they dreaded (self-fulfilling prophecy) than risking to suffer it later. This way, their fears come true time after time, so they unknowingly reinforce that low confidence, that turns into a low or short persistence. It would be legitimate to give up, or change the goal for other one that better suits our circumstances. As Carver and Scheier (2007) said, it's as important in life to keep on trying time and again as letting go and realize that we are not capable of doing it. Because the ability to make that kind of decisions at the right time is also a kind of competence. Be consistent with your objectives, adjust your level of commitment and you will always stay motivated. Carver, C.S, and Scheier, M.F. (2007): Engagement, Disengagement, Coping and Catastrophe. In: Handbook of Competence and Motivation. Edited by Elliot, A.J. y Dweck, C.S. Guilford Press. New York. Ericsson, K.A., Krampe, R.T. and Tesch-Römer, C. (1993): The role of deliberate practice in the acquisition of expert performance. Psychological Review 100, 363-406. Goleman, D. (1996): Emotional Intelligence. Bantam Books. Ruiz Pérez, L.M. and Sánchez Bañuelos, F. (1997): Rendimiento Deportivo. Claves para la optimización de los aprendizajes. Gymnos. Madrid. 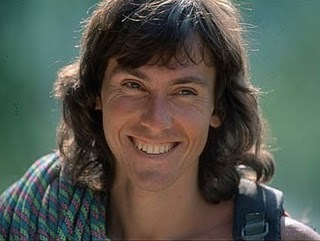 Simon, H.A. and Chase, W.G. (1973): Skill in chess. American Scientist 61, 394-403. 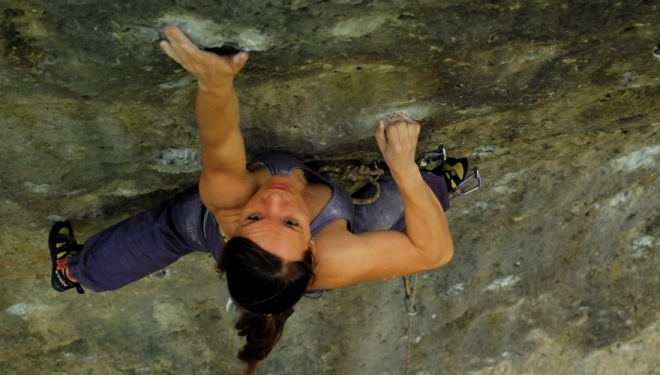 Lock-off training in Sport Climbing (III) Do you really lock-off? We completed the literature revision in previous posts, and now it's time to apply this knowledge, as I had set out to do. From these I have inferred some trends that can be of interest, although I need to make clear that this is a piece of field work and not a proper scientific study. So, the conclusions here exposed are more of a personal take on the matter. If we study in slow motion our pulling movements (specifically, our upper body; added sentence on 09/10/2012; thank you, Douglas Hunter) when we are not matching, resting, clipping, in compression moves (added sentence on 08/10/2012; thank you, Gianluca), or using tiny intermediate holds, we can divide the holds into three categories; H (the one we will Hold from), R (the one we are going to Release) and T (our Target hold). Then we can distinguish several phases. We are going to look at each of those phases to collect some data. This is when we are pulling with both hands from H (the one we'll keep holding) and, R (the one we are going to release); usually more force is applied on H, especially towards the end, when we are about to release R and go for T; the legs, and really the rest of the body help to impulse in a coordinated way. Duration: most of the time, 0,30 to 0,50 seconds. 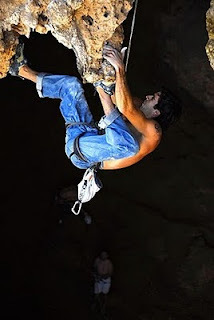 Duration: most of the times, 0,4 to 0,5 seconds, but it can be as low as 0,2 seconds in certain movements, more often with very explosive climbers, or as high as nearly 1 second on very long reaches in not very steep routes, especially with more static climbers. Luis Alfonso Félix. 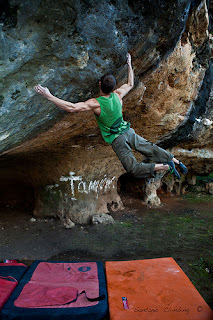 Eros Tensa el Arco, 8b+ .Cuenca. Photo: José Yáñez. Now, if we look more closely to this phase, we will realize that the static part of it, during which we are locking-off, is most often practically imperceptible. That's why in my previous post I thought it very interesting to reconsider the whole concept of locking-off. 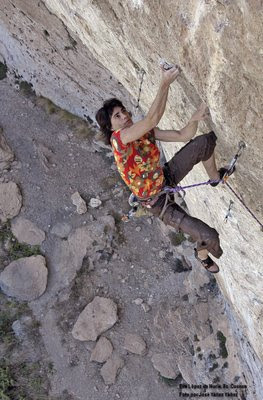 The best climbers devote very little to no time (0,15-0,30 seconds) to maintain the desired angle and actually lock-off. What they do is to take advantage of the previous impulse so that they can keep on flexing or extending their H arm before reaching the angle needed to grab the Target, in a way that leaves little to no room for an isometric phase. This is even more true when the holds are smaller and/or the route steeper. Helena Alemán. Spanish Climbing Championship (Gijón 2012). Our hands are already on the H and T holds, and we are locking-off to a certain extent (although most certainly with different angle and lower intensity) with our H arm, while we steady ourselves, do the required footwork, and adjust our fingers to the T hold so it can eventually transition into our new H hold. Next we will 'undo' the lock with our former H -and soon-to-be R- hold, and move our feet in preparation for the following move. Duration: most often 2 to 3 seconds, going up to 5 seconds or more in the most complicated movements. This phase comes out as the longest one. At this point it's important noting that if we reach a hold by dynoing, it will be fundamental to quickly and coordinately pull with both arms and the whole body (with emphasis in the lower back, waist and legs) to steady ourselves. 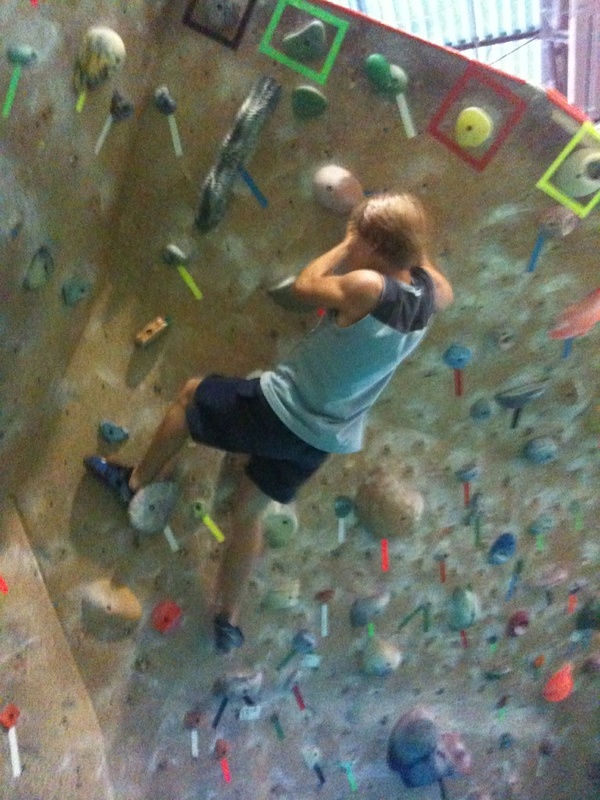 trying to onsight a route, while figuring out how to grip a hold. 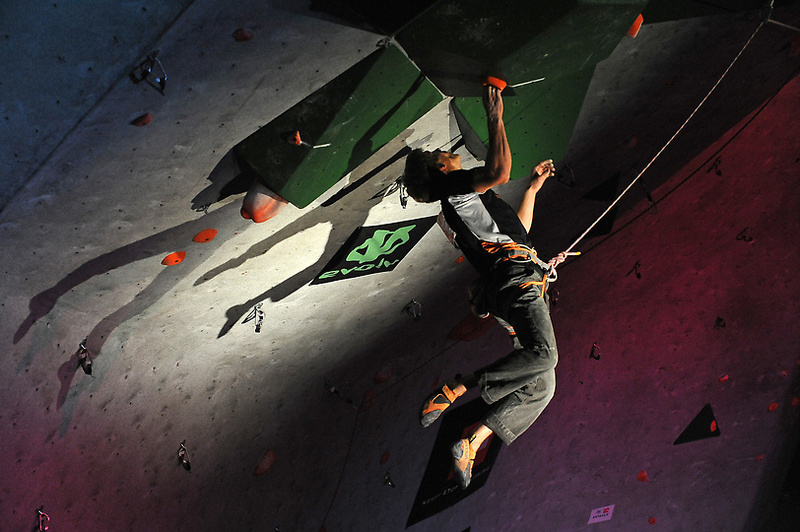 when clipping the rope, more often in competition where clipping points are used to increase the route's difficulty. Nevertheless, these figures are a function of level. 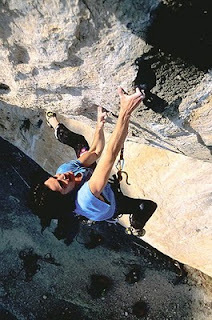 The more experienced climbers will try to clip more efficiently, keeping their arm straight and taking less rope. They will also need less time to sort out a section or a grip position while onsighting. 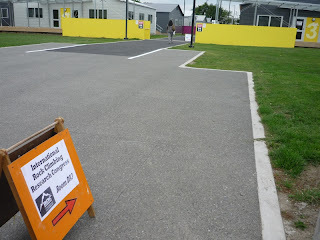 It varies with the steepness of the route and across different moves. The most used one, though, and the most specific is the 90º one. In second place come those close to 45º, typical of slight overhangs, transitions from roof to vertical and gastons. - The more overhanging and/or tinier the holds both hand and foot ones, the shorter the locking time for a given hold separation. - Personal style: hesitant and static; onsight (in contrast with worked), routes (compared with boulders) will yield the longest locking-off times for the same difficulty. - Girls in general show longer times in all phases due to our lower maximum and explosive strength. 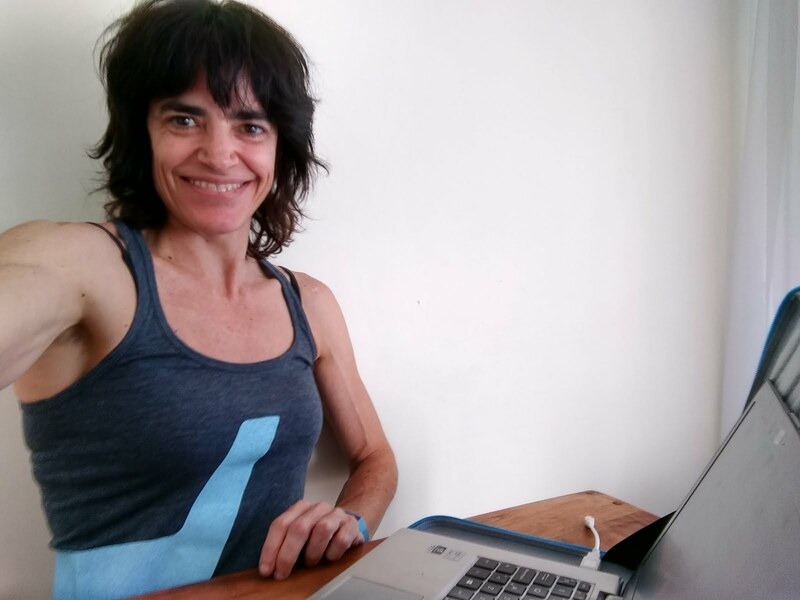 If we add that training frequently ignores gender particularities, and the tendency to choose routes that keep us from challenging our weaknesses instead of working on them, there is a tendency to develop a more static style. The outcome is an increased fatigue for a given route (due to a longer time grabbing each hold), lack of ability to solve certain moves like dynos or very steep overhangs, and a general slow down of progression. Even overuse injuries in the elbows. - Hand releasing phase: the intensity can be high or medium depending on the type of move and overhang angle, but as far a I have been able to observe, rarely does the H arm bear a high percentage of the body weight, and, as stated above, this isometric phase tends to be lower than half a second long. - Stabilization: Here body mass is already supported by both arms, so that intensity is even lower than in the previous phase. Nacho Sánchez. 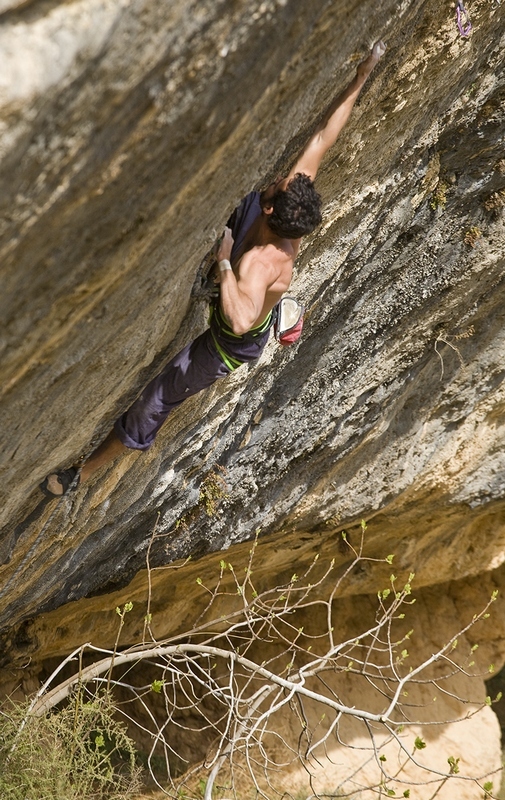 Tolmojón, 8B+ (Tamajón, Guadalajara). It is around 10-15 seconds in average. Less frequently, it lasts 5-8 seconds, or more than 20, but it is conditioned by the holds distribution, the need to clip and, as ever, the climbers' style. 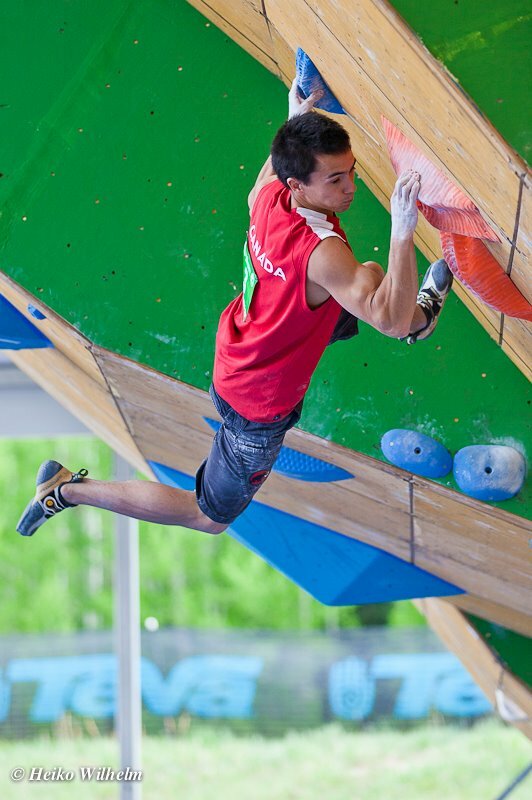 We need to be aware that we need to clip approximately every 2 movements in competition, or every 4 to 6 in rock climbing. 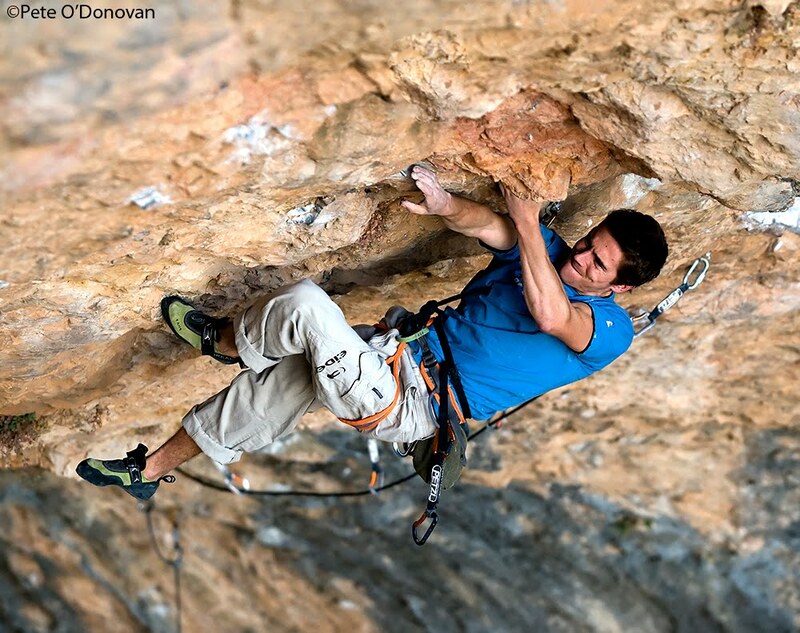 ¿Are any of these figures of relevance to medium and lower level climbers? The numbers above are applicable to climbers with a high technical and physical level, but can vary wildly among medium and low level climbers. In fact, they do. 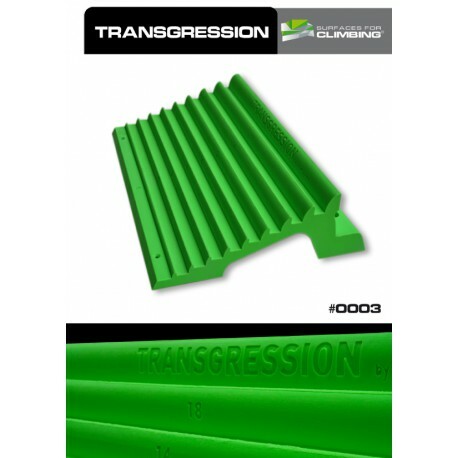 - insufficient memorization to climb fluidly through the key sections. ¿Does this mean that in these levels, or with these weaknesses, we need to work our lock-off more, or that it is better just to improve our physical, technical and tactical aspects? My answer is clear. It would be sensible to focus on the latter strategy during the initial and intermediate stages (2-4 years), and then to progressively include specific physical contents (like lock-offs, finger maximum strength, etc) once we are in the right path of technical-tactical improvement. All right, then... ¿is it useful to train 'long' lock-offs to improve an action that normally lasts less than half a second? My answer is Not. And, to elaborate on it, in the next entry I will talk about the importance of training for each of the phases using exercises whit specific duration, speed and intensity. 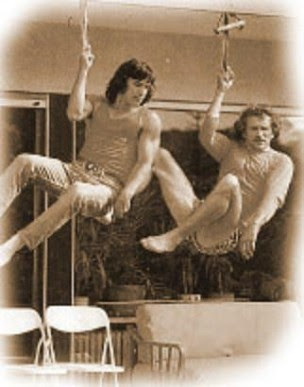 I can tell you in advance that we'll learn about some explosive isometric methods and exercises, that will try to develop our ability for reaching very quickly our force peak, within those tenths of a second when we 'stop' pulling and 'lock' to make contact with our Target hold. We will also take a look at other exercises with a duration and style oriented to the previous phase, when we are pulling from the holds, something that is tightly associated with the locking-off gesture. In addition, the the time that passes between the harder pulls and lock-offs should be enough to recover from them in most occasions. 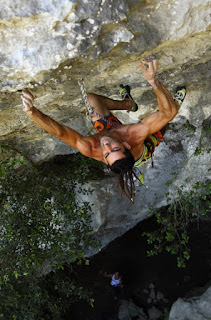 What kind of movements or routes can benefit from training our locking ability? For these, or other cases that you consider this ability is important for... what would be the best method to train it? Do you some days get to the gym only to find that you don't feel like training today? Are you tired even at home, although you have not made any physical effort yet? Do these symptoms ring a bell? 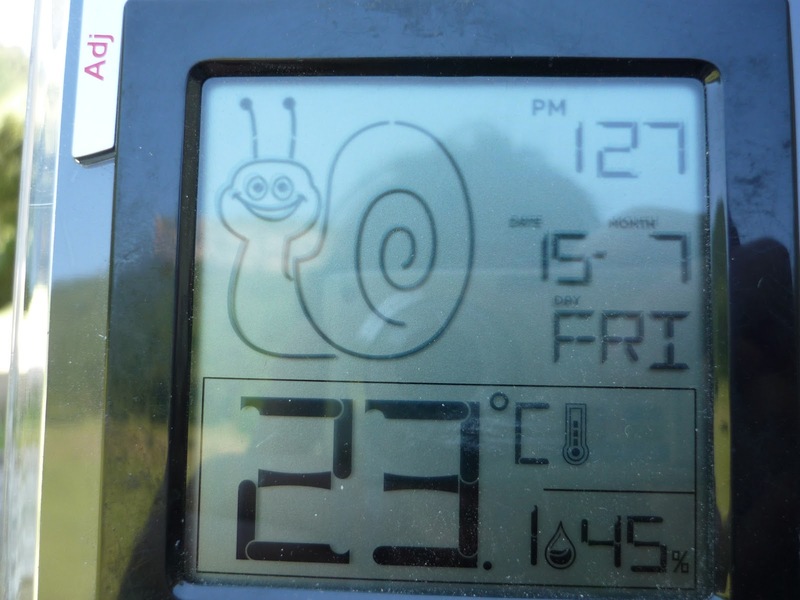 Perhaps you have experienced similar circumstances, "incidentally" associated to really hot days? Well, you are right, those symptoms are due to heat, and heat-induced fatigue. 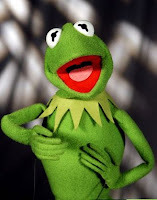 For life to go on, we need to keep our internal (rectal) body temperature between about 36,1ºC and 37,8ºC. (Córdova 1999). During exercise, the rate of metabolic heat production goes up, so that if this heat surge is not balanced by the rate at which we dissipate it, our internal temperature can get too high, and this is highly correlated with a decrease in sport performance. Exhaustion and inability to continue an endurance exercise are reached when internal body temperature goes between 39ºC and 40,3ºC, according to González-Alonso et col. (1997). 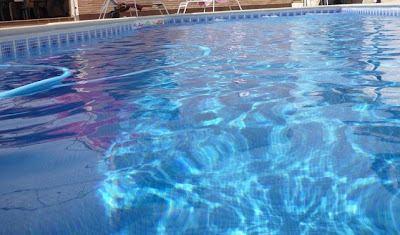 When it's hot, there is a lot of blood flowing towards the skin instead of the muscles used in the exercise, a higher oxygen consumption, an increase in muscle lactate, heart rate and sweating, and a higher spending of muscle glycogen; all in all, greater energy production (Willmore and Costill, 2007). It's believed that this fatigue and the changes inside our body can be caused by the direct effects of hyperthermia over the central nervous system, and are a defense mechanism of the body, that works like a "fuse" which prevents the athlete from keeping on producing heat and suffering heat-induced injury, heat stroke or even death (Terrados et col., 2004). Regulation of body temperature resides in the hypothalamus and it works in a similar fashion to our home's thermostat: when body temperature goes up, our central and peripheral thermoreceptors send signals to the hypothalamus and the cerebral cortex to voluntarily stop exertion, to get further from the heat source, or to boost our heat loss through vasodilation and metabolic activity (Terrados et col., 2004). What can we do to combat the negative effects of heat? It is vital to drink enough. For every liter of water lost, heart rate increases about 8 bpm. Less blood gets to the skin, so heat dissipation is compromised, and central body temperature goes up 0,3ºC for each liter of water lost (Coyle, 1994). It has been shown that a loss of just 1% of body weight (0,7kg for a 70kg athlete), causes a 5% reduction in our maximum time doing a continuous endurance exercise. Also, it's been suggested that hydration with a sugary or isotonic drink (6% sugar), improves the thermoregulatory system (Below, 1995). - and after training, taking 150% of the body weight lost, in 2-3 times starting with a big one (800-1000ml), and following with smaller ones during recovery (200 ml/15 minutes). It also seems that adding 5,6g/l of sodium (Shirreffs, 2000) improves body liquid recovery. Gorostiaga (2004) puts forward the following method for endurance training: doing a 45' precooling before the exercise, that can be performed in two ways: 1) staying inside a room with very cold (3-4ºC) air conditioning or being covered with ice, but using warm clothes over the muscles that are important for the exercise, or 2) staying up to the neck into cold water. Even though water immersion is recommended, it would seem reasonable to keep out of the water the muscles that will be more needed for the exercise (like keeping your legs out of the water if you are going to run). Keeping a low body weight will also help dissipating heat. Smaller people can get rid of excess heat easier than bigger and heavier ones, even if they have the same relative amount of body fat. This is because their body surface to body mass ratio is higher. This allows them to dissipate proportionally more heat than bigger individuals (Marino et col., 2000). This said, reduced body fat also helps in conveying heat to our surroundings, because an excess of fat increases the insulating capacity of the skin and slows heat conduction towards the surface (Mc Ardle et col., 1990). We will start to sweat earlier, the sweat will be less thick and higher in volume, our resting heart rate will drop, we will spend less glycogen at a given intensity, and the flow of blood towards the skin will improve. The first changes explain why when we are adapted to heat we need to drink more, not less. Heat adaptation doesn't mean the athlete getting used to training while dehydrated. To this day there is no evidence that humans can develop adaptations to dehydration. - If we want to perform in a hot environment, we should train with heat for at leas 2 weeks while we make sure we are well hydrated and observe the precautions needed to avoid heat stroke. The same goes if the environment is both moist and hot. -During the first days of adaptation, it's advisable to carry out the more intensive training sessions early in the morning or late in the evening, and reserve the hottest hours of the day for lower intensity sessions (Gorostiaga, 2004). Or we can reduce the intensity in this first phase to 60-70%, and progressively increase it, training at higher loads with high temperature for another 5-10 days until we are fully adapted (Willmore and Costill, 2007). 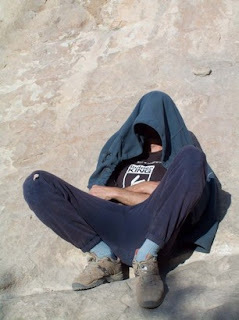 don't get all depressed if you return home from climbing at that high, cool crag, only to find that you will have to endure once again that feeling of slowly being baked. Below P.R., Mora-Rodríguez R., González-Alonso J. and Coyle E.F. (1995). Fluid and carbohydrate ingestion independently improve performance running 1 h of intense exercise. Med Sci Sports Exercise. 27:200-210. Cotter J.D., Sleivert G.G., Roberts W.S. and Febbraio M.A. (2001) Effect of pre-cooling, with and without thigh cooling, on strain and endurance exercise performance in the heat. Comp Biochem. Physiol A Mol. Integr. Physiol 128, 667-677. Gorostiaga E. (2004). 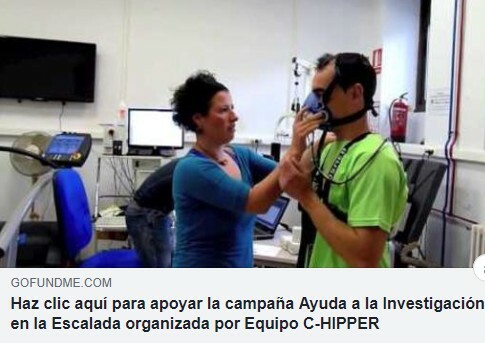 Adaptación al ejercicio en ambiente caluroso. Comité Olímpico Español. Marino F.E., Mbambo Z., Kortekaas E., Wilson G., Lambert M.I., Noakes T.D., Dennis S.C. (2000). Advantages of smaller body mass during distance running in warm, humid environments. Pflugers Arch. 441, 359-367. Noakes T. (2007). 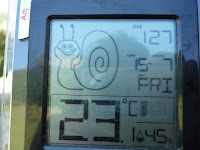 Exercise in the heat. In Brukner P. and Khan K. (Eds). Clinical Sports Medicine. 3rd edition. (pp 888-897) Australia McGraw Hill. Shirreffs S.M., Taylor A.J.and Leiper J.B. (1999). Post-exercise rehydration in man: effects of volume consumed and drink sodium content. Med. Sci. Sports Exerc. 28, 1260-1271. Terrados Cepeda N., Mora Rodríguez R. and Padilla Magunacelaya, S. (2004). La recuperación de la fatiga del deportista. Madrid. Edit. Gymnos. Willmore J.H. and Costill D.L. (2007). Physiology of sport and exercise, 3th edition. Human Kinetics. 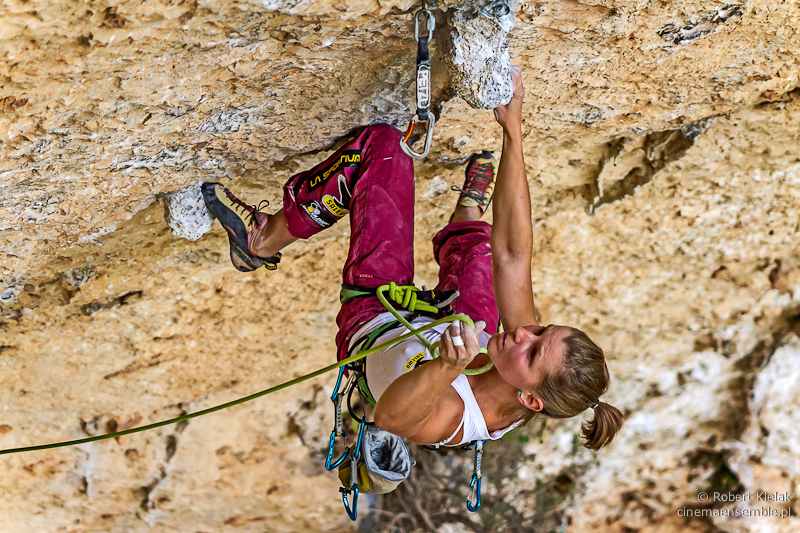 Lock-off training in Sport Climbing (II) Does our locking-off ability have any influence on our performance? Is it so important to train it? 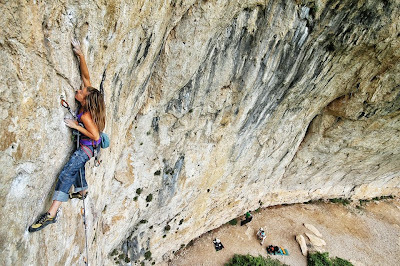 In modern climbing, it seems that the importance of upper body strength and endurance increases with difficulty (Giles et al. 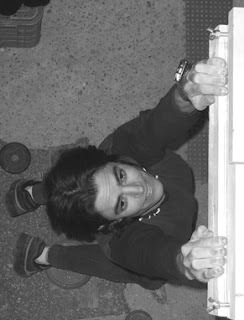 2006); difficulty being defined by longer distance between holds, smaller footholds and, often, steeper or more overhanging wall. 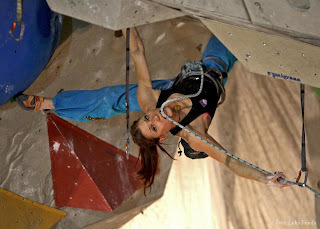 Noè and Quaine (2001), observed that in a ten-degree overhanging wall, the percentage of body weight supported by the hands and arms was 62%, compared to 43% for a vertical wall. These are among the reasons that allow authors like Watts et al. 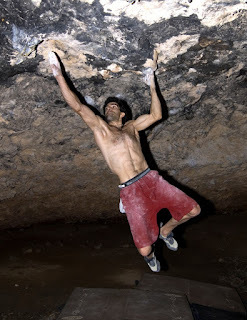 in their 2004 review of published studies to propose the upper body strength to weight ratio as one of the performance factors in climbing, and to suggest that pull-ups and lock-off tests be used to see whether this quality is a key performance factor for climbing. 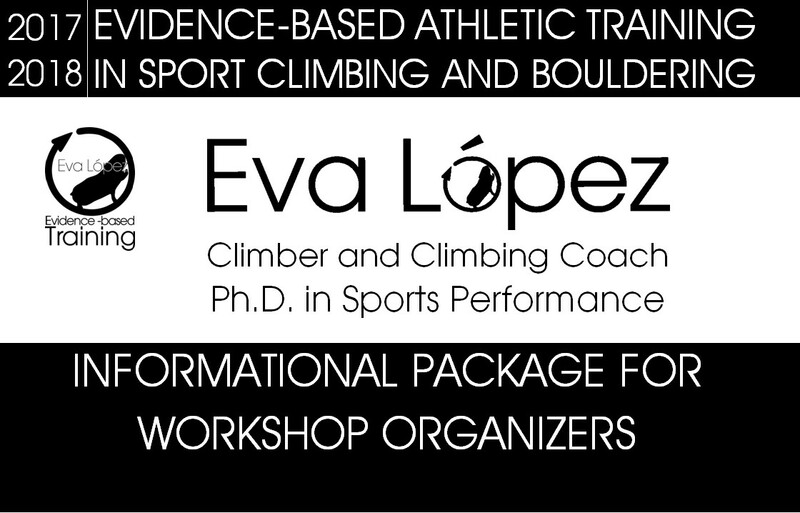 A key performance factor is one that allows us to set us apart from other sports, or can be used for talent detection, classifying climbers, or even as a predictor of performance. This means that by improving said factor, we would be improving also our level in the sport. Grant et col., in their 1996 study, showed that initiated climbers (redpointing at least 6a) did a significantly higher number of pull-ups than beginners or non-climbers. Analog results were obtained by Lezeta (2000), Lehner and Hayters (1998) and Leong (2009) among climbers of varying levels. 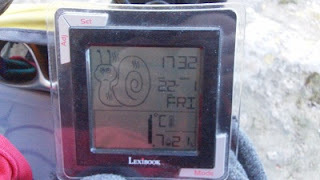 The same tendency has been found in the maximum 90º lock-off time (Grant et al 1996; Balas et col, 2011). 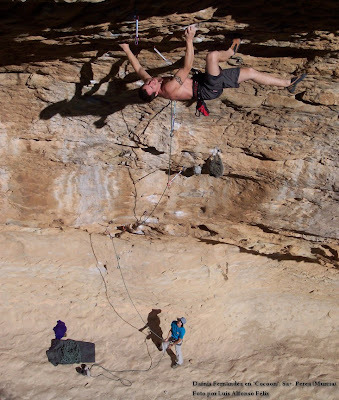 Some clarification is in order at this point, though, because Arija (2007) observed that pulling ability as measured by pull-ups to exhaustion with one's body weight had correlation to performance for lower and middle level climbers, but not for the higher level and elite ones. According to these authors, it means that this ability is important for progression from the lower levels, but it does not have much relation with performance at higher levels. Balas et al. (2011) found correlation between a 90º lock-off test and sport level, of 0,76 for men and 0,80 for women. Performance in this test was significantly higher for men than women, and this difference was even higher in the lower levels. These gender differences have been observed by other authors as well (Mermier et col, 2000; Binney and Cochrane, 2003; Leong, 2009). These results, along with the fact that the stronger female climbers performed significantly better in the study from Wall et al (2004), is what leads these authors as well as others like Grant et al. (2001) and Ballas et al. (2011) to believe that this test and/or the maximum pull-ups test (Binney and Cochrane, 2003), are more specific and predictive of performance for women. - 70-75% when considering lean body mass (Stone, Stone and Sands, 2007). So, it seems plausible that women who improve this aspect, would reap some performance gains. This, in fact, is what most of the authors propose, and what my personal experience confirms. Girls, let's do some weights and pull-ups! This is why I take the opportunity to encourage all female climbers to improve their pulling strength. They will be astonished by their performance gains. Then, is locking-off a key performance factor? Now, saying that there is -referring to both genders now- correlation between some test and performance does not mean that the exercise is unavoidably connected to performance, but rather that it measures some abilities that it has in common with performance factors. In this case, it tells us that upper body strength is important for climbing. - or because lock-off ability is a performance factor? The answer won't be found in the researchers' articles. 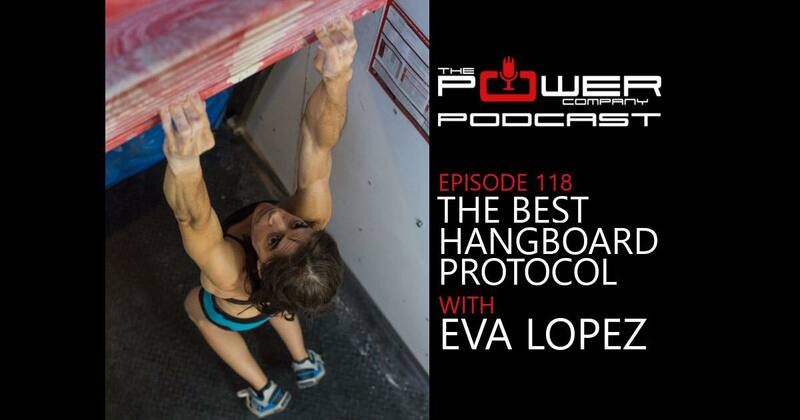 I have not found any studies that look at the relation between lock-off and pull-ups tests in climbers, male or female, or at the evolution of these qualities after a pulling force or lock-off training cycle respectively. 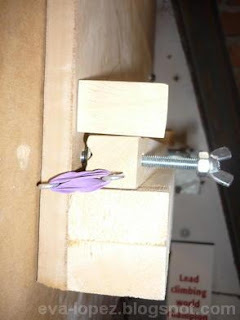 My personal take on this is that the connection of locking-off ability with performance is an artifact of the correlation between isometric tests and dynamic pulling force. In fact, the latter has an stronger correlation with performance than locking-off ability (Lehner and Hayters, 1998). This is easy to buy, since if we can't make a reach to the next hold, there is nothing left to do. 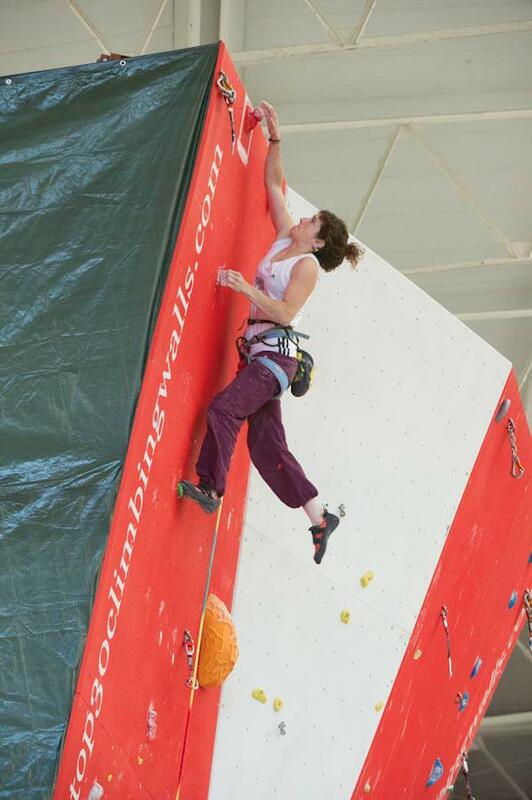 In this same line, Binney and Cochrane (1999), propose as an specific test of elite climbers' performance, the ability to pull until exhaustion on a campus board with 30 mm edges 200 mm apart, given the high correlation found, of 0,92 and 0,82 for males and females respectively. 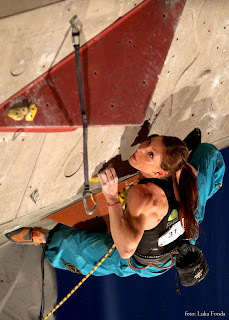 Another specific test for upper body power, related to performance in climbing, is Draper et al. (2011) "Powerslap", which consists of hanging off two good holds and doing an explosive pull to reach with one hand as high as possible (r2=0,51); there's a similar "campus test" by Leong (2009), with which a correlation of 0,88 and 0,77 for men and women was observed. 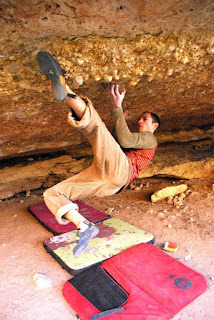 Based on these results and my own experience, my current position on this topic is that locking-off, in modern climbing and with the exceptions that we will comment in another blog post, is not a general key performance factor. - the initial impulse force together with the coordinated action of the whole body (especially legs, shoulder and triceps in long reaches); this can be trained through pull-ups, campus board over big holds or boulder problems with long moves. 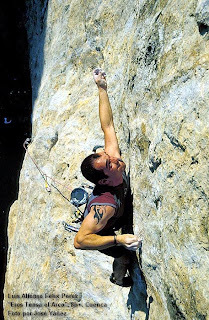 - the grip force of the hand that we are pulling from, but also of the one that we are reaching with, because it has to help as much as possible to get momentum before releasing the hold and later must be able to rapidly grab the next hold. Then... what about training lock-offs until exhaustion? Apart from making them slow, inefficient and indecisive while climbing, induces unnecessary stress on the elbow, a relatively small area where a lot of structures converge (bicipital aponeurosis, ulnar colateral ligament, ulnar nerve, pronator teres, flexor muscles); when all of them in unison experiment shortening/stretching, high tension or compression (specially with a pronated grip), and the reduced blood flow associated to isometric contractions, we can easily visualize the risk of overuse and injury. The issues discussed in this entry almost entirely kept me and my trainees from training lock-offs. But now that I have done a more thorough review of the current knowledge in this matter, I realize (repeat with me) that things are not so simple, and at least it's necessary to revise the current concept of lock-off, and its training methodology. Arija, A. (2007): Relación entre una dominada a máxima velocidad y repeticiones máximas hasta el fallo en escaladores y no escaladores. Trabajo para obtención del D.E.A. Facultad de CC de la Actividad física y el deporte. Universidad de Castilla-La Mancha. Dr.: Navarro Valdivieso, F.
Binney, D.M. and Cocchrane, T. (1999): Differences in strength between males and female competitive rock climbers. Binney, D. M. and Cochrane, T. (1999). Identification of selected attributes which significantly predict competition climbing performance in elite British male and female rock climbers. Journal of Sports Sciences, 17(1), 11-12. 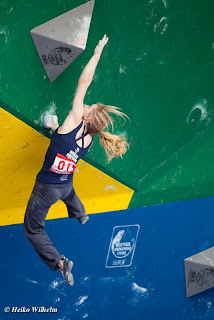 Draper N, Dickson T, Blackwell G, Priestley S, Fryer S, Marshall H, Shearman J, Hamlin M, Winter D, Ellis G. (2011): Sport-specific power assessment for rock climbing. J Sports Med Phys Fitness. Sep;51(3):417-25. Giles L.V., Rhodes E.C., Taunton, J.E. 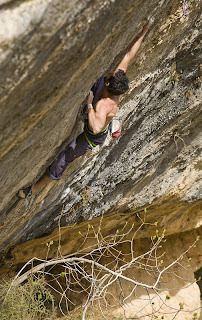 (2006): The physiology of rock climbing. Sports Med; 36(6):529-45. Grant, S., Hynes, V., Whitaker, A. and Aitchison, T. (1996): Anthropometric, strength, endurance and flexibility characteristics of elite and recreational climbers. Journal of Sports Sciences, 14, 301-309. Grant, S., Hasler, T., Davies, C., Aitchison, T. C., Wilson, J. and Whitaker, A. 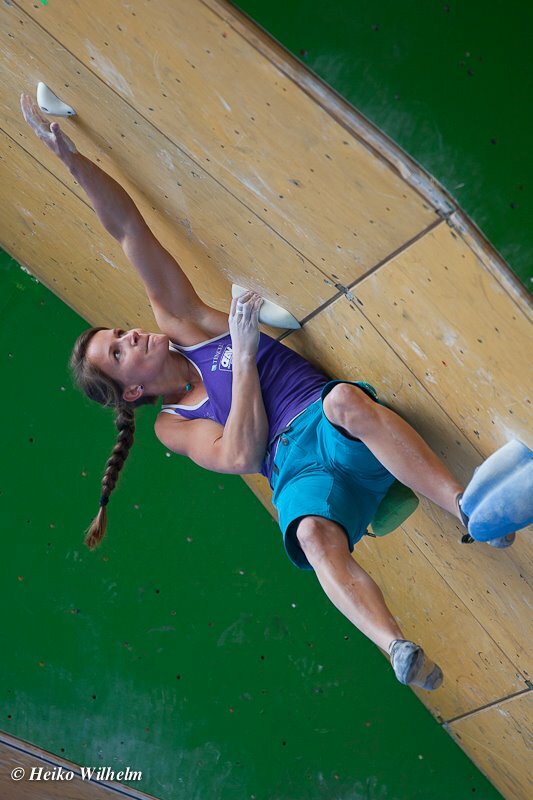 (2001): A comparison of the anthropometric, strength, endurance and flexibility characteristics of female elite and recreational climbers and non-climbers. Journal of Sports Sciences, 19, 499-505. 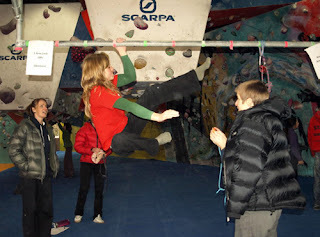 Leceta Aulestia, F. J., (2000): Evaluación de la fuerza en la escalada deportiva. Revista Digital. Buenos Aires. Año 5. Nº 21. Mayo 2000. Leong, C.H. (2009): A comparison of upper body power, strength, endurance and flexibility characteristics of sport climbers and boulderers. Thesis presented to the Department of Kinesiology. California State University. In partial fulfillment of the requirements for the Degree Master of Science in Kinesiology Option in Exercise Science. Wall C.B., Starek J.E., Fleck S.J., Byrnes W.C.(2004): Prediction of indoor climbing performance in women rock climbers. J Strength Cond Res. Feb;18(1):77-83.